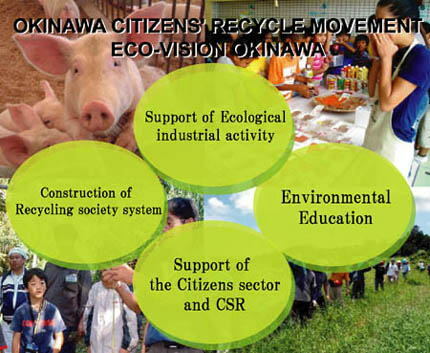 Okinawa Citizens' Recycling Movement (OCRM) was established as nonprofit organization in 1983. The theme of our activity is garbage, recycling, environmental education, and a civic action. 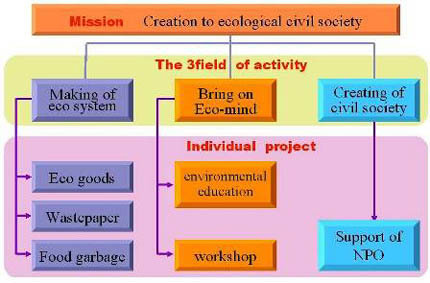 Eco-Vision Okinawa（EVO） is an incorporated nonprofit organization established by the members of OCRM in 2000. EVO does the activity of environmental education, and support of the civic group aiming at the achievement of an ecologic society. 40 percent of the garbage exhausted by the Naha City is food garbage, and many of them are disposed of as burnable waste. Especialy, In Okinawa with much sightseeing-related work, the recycling of garbage drained from a hotel and a restaurant and super is a big problem. Then, we began the garbage circulation system that aimed at the loss in weight of garbage in 2001. In this project, garbage of supermarkets, food factories, and hotels is made fodder and compost, and they are used by the stock raising farmer. The Shopping Game is an environmental education program to enlighten the garbage loss in weight. Our staff goes to the elementary school and the environmental education program is executed. We are doing the management of the nature experience training institute for the child. Food and the chemical-free vegetable, etc. without coffee, tea, the handicraft goods, and the additive of soap without the additive, soap to have recycled the oil used, and a fair trading are sold.